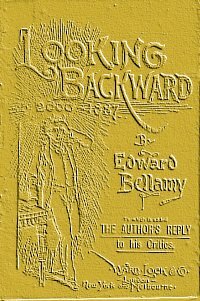 Edward Bellamy's Looking Backward is a Christian Socialist "utopian" novel published in 1888. Several years ago I decided to use it as the novel in my ENL 121 -- Introduction to Literature course, simply to see how students would react. The novels I had used in previous years evoke some, but not very much interest, primarily because students did not see much of a connection between literature and life. Although not all students become engaged, Looking Backward evokes much more response, especially because the novel addresses current major problems: the lack of jobs, unions, education, health, the roles of women in society, and the wide gap between the rich and poor. In some ways, of course, Bellamy's ideas are outdated, but in several others they are almost prophetic. Shopping in his idealistic Boston, for example, resembles, in many ways, shopping at Amazon. More importantly, perhaps, many of Bellamy's ideas were and continue to be controversial. Class discussions can become lively, but usually the most controversial ideas involved the economic organization of Bellamy's vision. Some people might say that it is totally Christian and totally Socialist. In essence, everyone works for the state, the state is controlled by the people, and the Gross National Product is divided equally among every adult--males and females. In other words, everyone gets the same amount of money (credit) annually, no matter what their job. My students have calculated that this currently means that everyone would get approximately $50,000 per year. People who refuse to work do not get the credit--they have to live on bread and water. This system raises numerous discussions. I do want to note that I encourage students to disagree with me (and with Bellamy). As I set this up for the first time, I have in mind one paper in particular that argued that Bellamy's ideas are all unrealistic. I really enjoyed reading and grading that paper. I wrote a number of comments challenging the student's ideas--and I also gave the paper an "A." The writer was invited to submit the paper, and I hope that I will get it. I will not, by the way, comment here on the ideas in any of the papers. This site is actually an extension of the assignment. Future students will be able to cite and build on (agreeing to or disagreeing with) the arguments in these essays. The following list of topics includes some that students have not yet addressed. When papers are submitted that do not fit this list, the relevant topic will be added. In other words, this list provides additional suggestions (and sources) for the assignment. Please remember that I'm looking for "substantive" papers. By that I mean two things. First, a paper can be substantive by citing credible sources on the topic (such as "innately good or evil"). Second, Bellamy presents an economic, political, and social overview in a 165-page novel. Obviously, he does not include a lot of details on how things would work, but students can use research and their imaginations to supply such details. For example, if an individual wanted to write music, design and make clothes, or write computer apps, how would they be able to do so (specifically) in a current version of Bellamy's utopia? In many ways Bellamy's utopia is impractical in today's world, but there are many ideas in it that can be applied to our society. The papers in this section discuss some of them that do not apply to the other sections. Are people innately good or innately evil? In addition to those, however, for this assignment I'm expecting the students to find and use at least one additional credible source on the question. There are no jails in Bellamy's Boston of 2000. Dr. Leete, Bellamy's spokesperson in the novel, claims that this is so because almost all crimes result from the unequal distribution of wealth. Although many, perhaps the majority, of crimes can be so viewed, students have rightly noted that many crimes are the result of hatred, jealousy, etc. The papers in this section address this question and suggest how Bellamy's society could, or could not, address the problem. Among the papers I'm hoping to see here are one on current welfare requirements and two that offer suggestions for requiring "volunteer" work from people currently on welfare. It's a very interesting, but also very complex problem, so I'm hoping that future papers will build on the first ones in this section. Bellamy claims that in his Boston of 2000, everyone gets a free education until the age of 21. But he is very unclear about what that education consists of. These papers should start with what Bellamy says, and then attempt to fill in, in more detail, what students would have to study in order to be good citizens in that society. In Bellamy's vision, there are no private companies. That has raised questions from many students about its implications. Because there will be no companies to compete, will the society make new products and new inventions? If so, how? One of the reactions of many students worries me. They do not see any possibility for individuality in Bellamy's vision. I'd love to see papers that support this view of the students, and also papers that argue that the view is incorrect. Bellamy claims that because each woman receives the same credit as every man does, women are liberated and equal to men. Several critics have challenged his view, so this is a very controversial topic. What other flaws are there in Bellamy's vision? This section is for papers that attempt to explain several practical flaws in the vision. Remember that this list is only a sample. The novel is very controversial, and many topics could be added.